CaribPR Wire, NEW YORK, NY, Fri. June 22, 2012: The Caribbean region is rich in renewable energy and possesses tremendous capacity for solar, geothermal, tidal and wind projects. That’s according to Jay Yeo, President of Solamon Energy, which is building the largest solar energy plant in the Caribbean region. Yeo made the observation at June 6th Invest Caribbean Now power forum, hosted in New York City by digital media company Hard Beat Communications and the Caribbean Tourism Organization. His comments come as the latest “Climatescope,” the first annual report, index and interactive web tool which scores 26 nations on their relative ability to foster low-carbon energy growth in the region of Latin America by the Multilateral Investment Fund of the Inter-American Development Bank and Bloomberg New Energy Finance, showed Brazil, Nicaragua and Panama grabbing chunks of investment in renewable but the Caribbean region way down the list with the Dominican Republic at 15. Yeo said investment in renewables, especially solar, will not only lower the cost of energy across the region but helps create 11 times more jobs than natural gas or coal. “Capital intensive renewable energy is an important vehicle to increase the inflow of capital into the Caribbean and achieve economic growth, said Yeo. Forum delegates also heard from North American investors, Jonathan Blue, who touted his positive investment experiences, in the Caribbean region; CTO Chairman and minister of St. Kitts/Nevis, Senator Ricky Skerritt; Jean Arnell, vice president of the French Saint Martin Chamber of Commerce; and Lisa Lake, Chief Entrepreneurship Officer of the Branson Centre of Entrepreneurship – Caribbean. One of the world’s most renowned and successful entrepreneurs, Sir Richard Branson, was this year’s inaugural Leadership Award recipient. The forum was moderated by W. Dave Dowrich, V Vice President of Risk and Capital Markets in the Financial Institutions Group at Goldman Sachs. 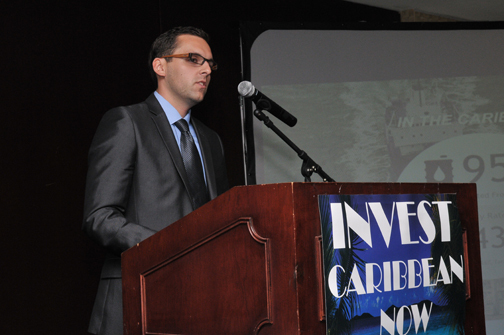 The Invest Caribbean Now 2012 forum was funded in part by The French Saint Martin Chamber of Commerce, (CCISM), One Caribbean Television and Teamsters Local 237, a union of 24,000 New York City employees who work in government agencies and several municipalities on Long Island, while supporting sponsors included the PR Newswire, CaribPR Wire, News Americas Now and Damoola Inc.